The KVK is located at Reddipalli (village), Bukkarayasammudram mandal of Anantapur District in Andhra Pradesh, which is 10 km away from Anantapur town on Anantapur – Tadipatri highway. The nearest Railway Station is Anantapur. The KVK can also be reached through air route for which the nearest Airport is Puttaparthi (80 km). The KVK has the most modern communication facilities which are connected to the outside world through the Telephone, Fax, Internet etc. India is basically an Agricultural Country, where 70% of the people are depending on agriculture directly or indirectly. 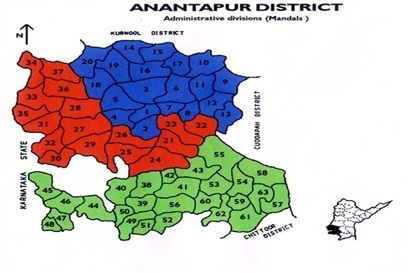 In Andhra Pradesh, Anantapur is located in arid zone where the rainfall is for below the evapo-transpiration, thereby causing instability in agricultural production. Research has been carried out keeping in view the resource poor farmers for their betterment in the Agricultural Research Station of Acharya N.G. Ranga Agricultural University, Anantapur Central Research Institute of Dryland Agriculture, Hyderabad & ICR / SAT. What all the research carried out is not reaching the end users i.e., farmers. Apart from Agriculture there is a scope for enhancing the income of the farmers through other farming systems like Horticulture, Sericulture, Animal Husbandry, Fisheries, etc. Hence there is need for an effective extension agency to carryout the latest research in various fields to the farmers through Trainings, Demonstrations and other extension activities. Keeping this in view, the KVK was started in 1983 with the objects and mandate given subsequently. In Anantapur district, canal irrigated red soil farming situation occupies 3rd place covering 2.2% of the total cultivable area. Tungabadra high level canal is the major source of canal irrigation. A farmer sri. Muthyal Reddy of Venkatampalli village has grown papaya of Red Lady var. in 4 acres which are of one year old.